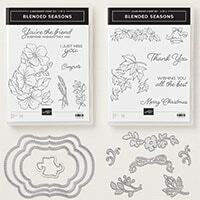 I'm so excited to share with you a new LIMITED EDITION offer, it's the new Stampin Up Blended Seasons Bundle – and it is STUNNING! We will get into all the fabulousness of it all in a minute, let me give you the details real quick. It is launching on August 1st, and is while supplies last until August 31, 2018. The last time they did something like this, I believe it sold out in like 4 days – crazy short amount of time. So if you like what you are about to see, set an alarm on your phone to make sure you order it on the 1st! The stamp set and framelits are available as a bundle 🙂 So that means saving money! For this project, I didn't go with the Watercolor Pencils – I actually didn't order them, because to me, I wanted to use all my new Stampin Blends. 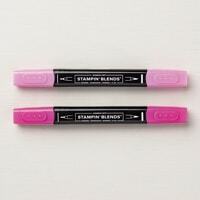 I prefer the Blends to the Watercolor Pencils. But you go with whichever you like best! 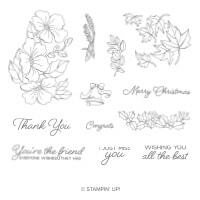 I started by stamping my floral image in Tuxedo Black ink – it is the recommended ink pad for the Stampin' Blends. And then I stamped my sentiment on a 1/2″ scrap of Whisper White in Melon Mambo ink. I chose the Just a Note sentiment from the Soft Sayings stamp set. This stamp set is one that is really overlooked. I think everyone misses it because it is in the kit section. It is in a kit, and I will be the first to admit, I don't totally love the kit – but I do love the stamp set. Here it is. Do you see all those wonderful sentiments with all the great fonts? 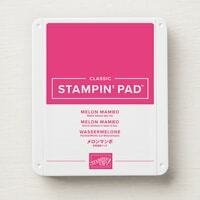 I am such a font junkie, so this stamp set really jumped off the page to me. 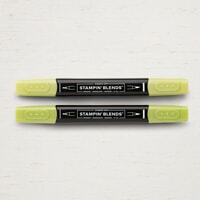 And it works great with the Stampin Blends, so another win in my books. For my flowers and my leaves, I start by doing one section at a time. I cover it with my light color first, and then shade where I want it darker with my dark marker, and then blend it out with the light. 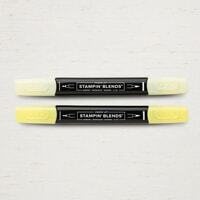 To learn more about using the Stampin' Blends, click here. It did take some time, but it was ssssooooo relaxing. If you are looking for ways to unwind, give coloring a try! I struggled a bit with choosing my colors for the sentiment. Not the green, but the pink for sure. The Lovely Lipstick Blends gave me the exact color I wanted for my flowers, but then seemed to dark for my sentiment stamping and my punched piece. Since I used a lot more of my light Lovely Lipstick Blend than my dark, I found that the Melon Mambo card stock looked better. Then it was time to punch. I so heart my Tailored Tag punch, but I just haven't been using it much here lately. But it is the PERFECT size and shape for this project. 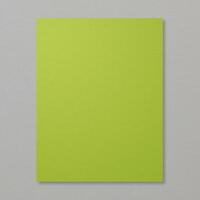 I punched first with Granny Apple Green card stock, and then again with Melon Mambo card stock. Moving on… I dry embossed it with my absolute favorite folder, it's the Subtle folder. It takes any card stock and makes it textured card stock. Where has this been all my life?!?!?! 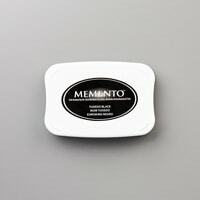 But I needed to resize the Melon Mambo. 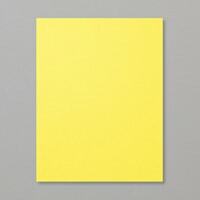 To do that, I grabbed my handy dandy stack of post it notes that no stamper should ever be without, and stuck it to the top of the punched piece. Then I slid the punched piece back into the punch, leaving a gap a the bottom, then punched again. That gives you a perfectly proportioned downsized Tailored Tag Punched piece *try saying that three times fast! All that you will have left to do is the layering and adding a cute little bow. I went with the Pineapple Punch Stampin Blend instead of Daffodil Delight because I have a narrow Pineapple Punch ribbon. Winner, winner! 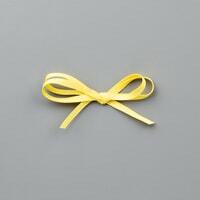 If you struggle at all with tying bows, be sure to get a 10 Second Bow Maker. It really works!!! To order any of these supplies, simply click a picture below and add it to your shopping bag. Thank you so much for stopping by today! 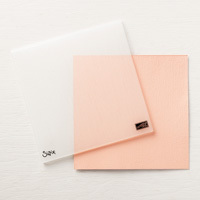 I love sharing projects with you that any level of stamper can confidently create. If there is any part of this project you will to see in more detail to get you to that point, PLEASE let me know. That's what I am here for. I believe completely in the name of my company, which is I Teach Stamping – not I show pretty cards and hope you can figure it out 🙂 I hope you enjoyed the sneak peek of the new Stampin Up Blended Seasons Bundle. I do expect it to sell out, and sell out rapidly! Be sure to keep checking back as I will be featuring other parts of the bundle over the next few days. Such a pretty card! I love the way you made the mat for the punch, I would have thought it would have to be cut by hand. Never would have thought of using the Post-It, that’s a great tip! Thanks! Thanks Connie! You can do so much with your punches altering their original design. **Note to self, put this in Stamping Family with different possibilities!! I loved the color combo and the punch tip. Genius! Do you have a tutorial to alter the original design of punches to purchase? 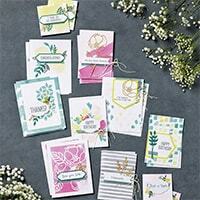 Loved these beautiful cards and ideas. Your creativity is amazing! Enjoy your day!